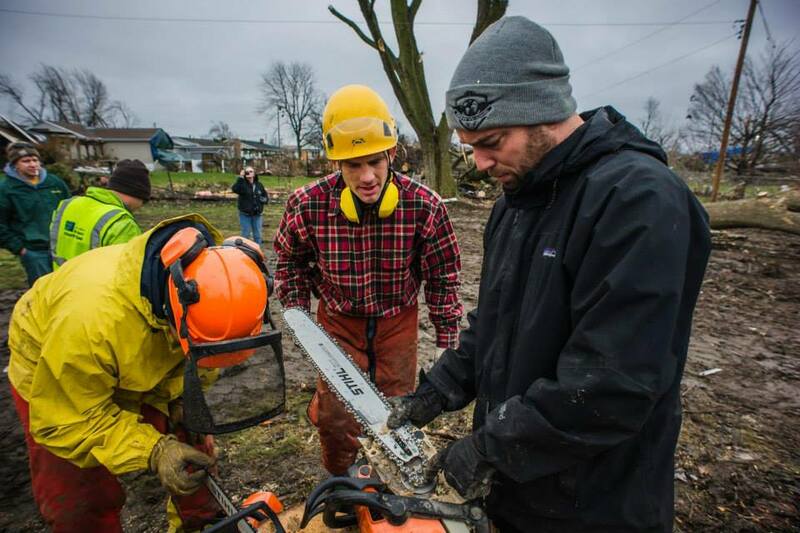 The team had a great start to the final day here in Illinois where they were able to help the power company clean up some old power poles by cutting them up for removal; they also continued to work with the couple that had a lot of tree debris in their yard. A professional arborist gave them some great pointers for running and maintaining our saws. He has had a STIHL for over 10 years and all he's had to do is replace the muffler. Here is an update from a team member on the ground in Washington, Illinois: After a busy morning we moved on to a completely leveled house where the man leaning on the shovel (photo in gallery) was in the basement of his house and the only thing that saved him was two end tables his grandfather made over 60 years ago when the wall fell on top of where he had taken cover on the ground. He dug himself out but had to have neighbors help him get out of the basement. He was very emotional about the whole thing but beyond happy to be alive and unharmed. We cleaned up his whole house and got it to the curb after going through and collecting all his valuables. Next we went back to the yard we have been working on for a couple days and cleared a tree that had powerlines going through it. We ended up going with a 36 inch STIHL saw and got it taken care of and cleaned up right at dusk. With just enough time for a few group shots of the crew. The Caterpillar 289c moved more debris than any of us could of imagined. Without it and Chovy running it we would not have been able to accomplish nearly what we did. Chovy moved more debris than any other operator we saw. Even the state road department clean up crew couldn't keep up with what he was moving. And that's the end of the trip. We have helped so many people and affected so many lives for the better. Restored power to a section of neighborhood that would still be waiting for power crews to get in and clear trees. I want to thank ROWW for this amazing opportunity to help so many people. It showed me what people are really capable of in a disaster situation and the sense of community support that every single person we met had to give. Thank you to STIHL for supporting us on this mission providing us with the best equipment to get the job done. 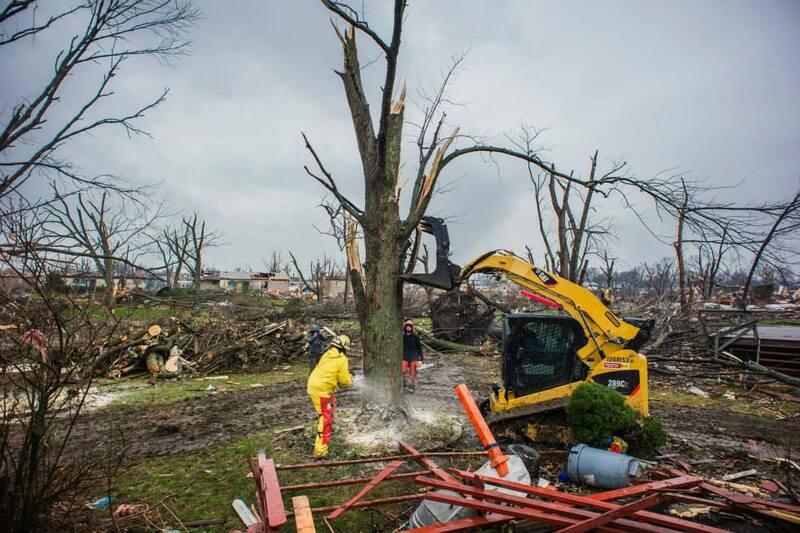 Our team arrived on scene today ready to help the residences of Washington, Illinois who got the brunt of the blow of the EF4 tornado on Sunday. The epicenter of the area was closed to all contractors and disaster relief organizations due to the power companies trying to restore power to the houses that still had walls standing. We quickly explained how we could help with STIHL gear in hand and a Cat skid steer (conveniently placed in view) to do our heavy lifting and we were welcomed right in. Immediately, the emergency linesman put us to work clearing fallen trees that hung on power lines or had fallen in positions that made it impossible for their trucks to gain access to their power poles. 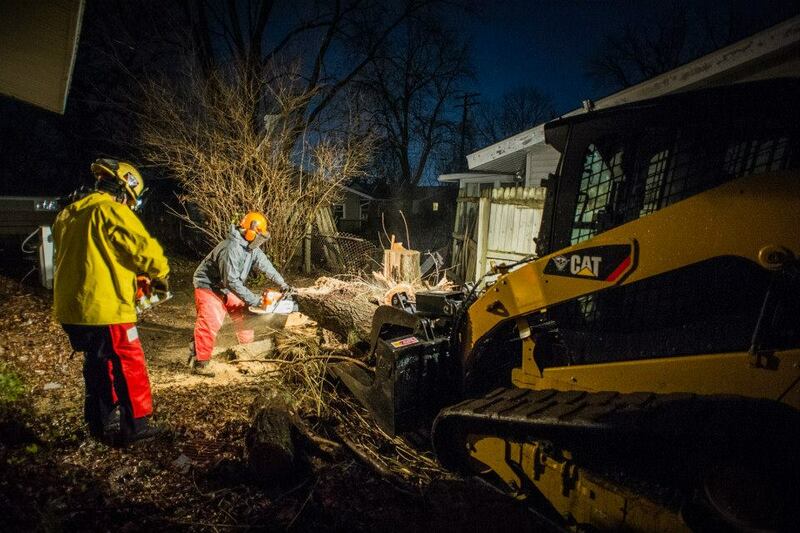 We also cleared trees and debris covering homes or hanging in dangerous situations above heads. Looking forward to another productive day tomorrow! 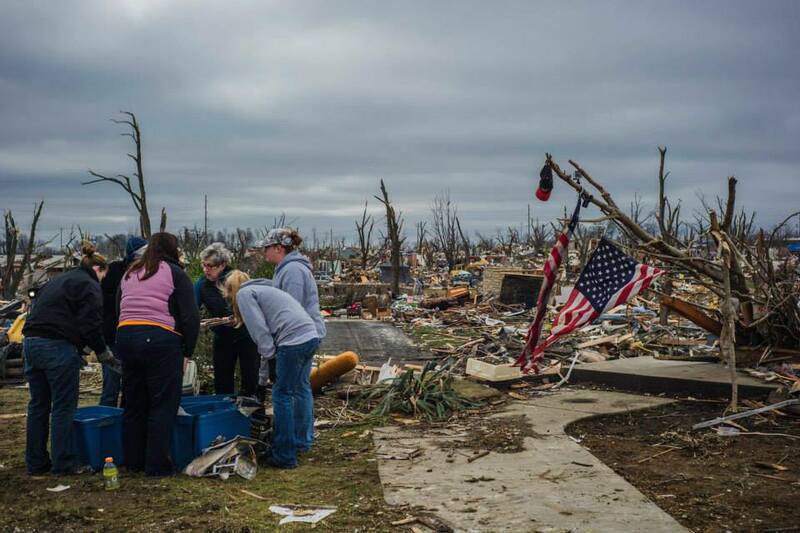 As one of our medical teams assists needs internationally in the Philippines, ROWW simultaneously launched a domestic deployment to aid relief efforts in Illinois. 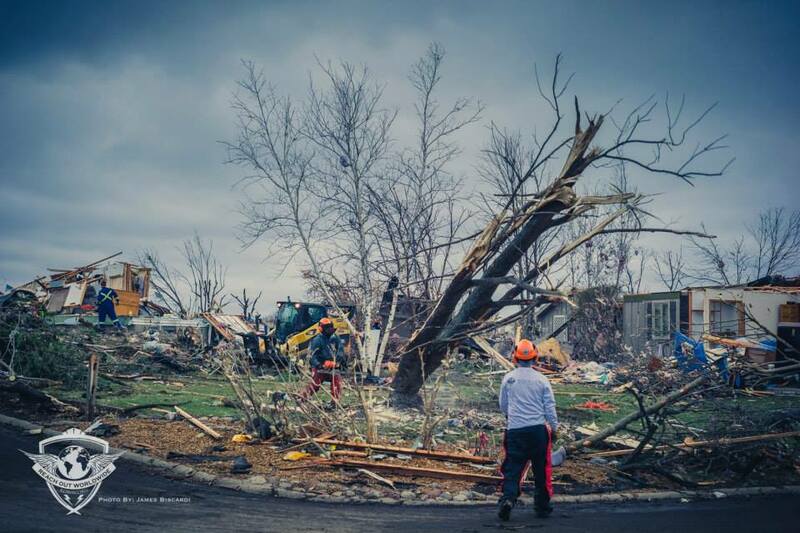 On Sunday, 16 tornadoes swept through the state of Illinois, leaving several towns picking up the pieces. 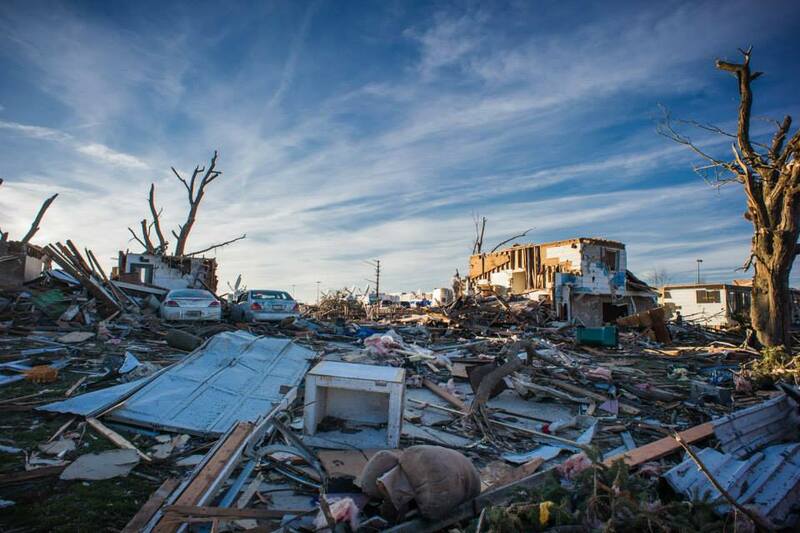 The city of Washington was hit by an EF-4 tornado, which had winds of 190mph and stayed on the ground for 46 miles destroying 500 homes in its path. 13 counties have been declared disaster areas. 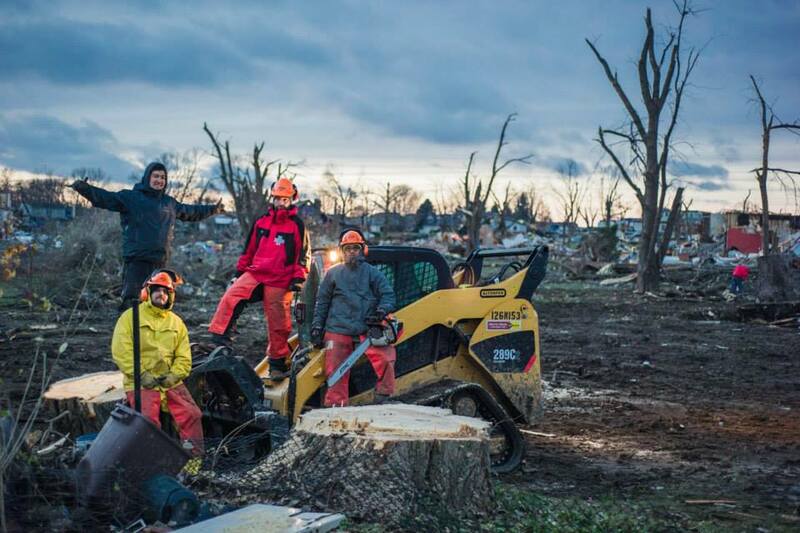 Our team of first responders, armed with STIHL and other heavy equipment, are on the ground to safely remove debris, fallen trees etc. 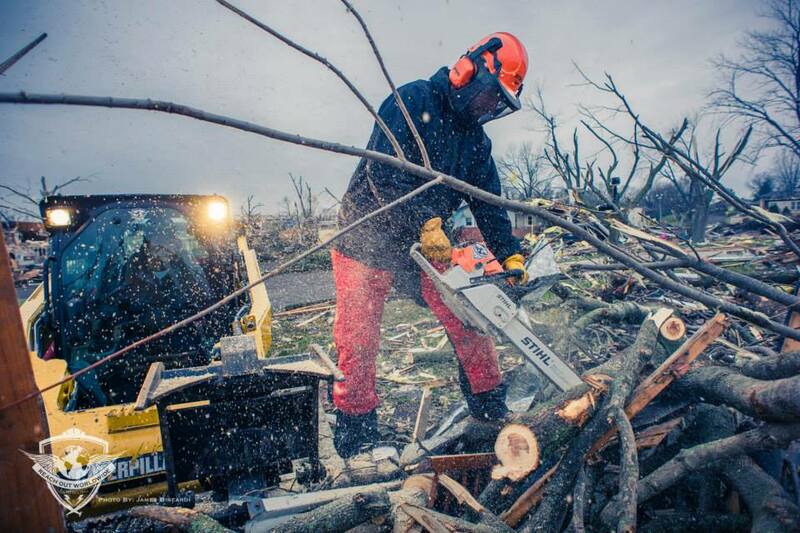 helping families in Illinois and surrounding areas rebuild. ROWW team members, Micah and Jake spent most of day one clearing trees so the power company (Ameren Illinois) can restore power. Thank you for supporting ROWW in our efforts both domestically and internationally.